I have been sadly and embarrassingly neglectful of this blog (and my Virtual Stable, but that’s another story) for, oh, about 3 months now, so I’ll be trying to backtrack and cover some of the biggest stories of that period. But first up is a very recent one about the discovery of a new species of snub-nosed monkey in Burma. The species was discovered in Himalayan forests by primatologists from Fauna & Flora International, the Myanmar Biodiversity and Nature Conservation Association, and the People Resources and Conservation Foundation. Locals, who say the monkey sneezes when it rains, call the monkey mey nwoah or “monkey with an upturned face,” but it will now also be known as the Myanmar snub-nosed monkey. Sadly, the monkey is critically endangered due to logging and hunting. The monkey looks somewhat like Skeletor (see article from Telegraph UK for proof), but I guess this is not enough to discourage the locals from eating it. I guess they’ve never seen He-Man. Perhaps conservation efforts should focus on exporting this cartoon to the forests of Burma as soon as possible. Camera traps in the Deramakot Forest Reserve of Malaysia’s Sabah state have captured images of the hairy-nosed otter. The otter had not been seen in Sabah in a century, and the last one known in all of Borneo was an animal that was struck and killed by a car in Brunei in 1997. The otter was photographed as part of the Conservation of Carnivores in Sabah (ConCaSa) project being conducted by the German-based Leibniz Institute for Zoo and Wildlife Research and the Sabah Forestry Department. Although the photograph was taken in 2008, the identity of the species had to be verified by experts before the results were published in the journal of the International Union for Conservation of Nature Species Survival Commission (IUCN/SSC). The ConCaSa project also captured the first-ever video footage of the otter civet. Read the full story (and see a photograph of the otter and a still from the civet video) at Free Malaysia Today. This is too bizarre not to share. A southern right whale breached right next to a pleasure yacht off the coast of South Africa and then slammed onto the deck of the boat, snapping the mast in twain and destroying various other portions of the boat that I imagine are crucial to the whole sailing bit (I don’t know boats). The couple on board the boat were unharmed and were able to use the engine to putter back to shore. They seem to count themselves lucky that the hull of the boat was steel instead of fiberglass, since a less sturdy boat could have been sunk by the unexpected visitor quite easily. The couple speculates that the whale, which was probably a youngster based on its size, escaped serious injury and is probably just “very badly bruised.” See the full story, with incredible photos, at The Daily Mail. 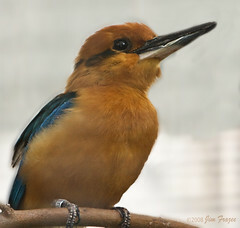 The Lincoln Park Zoo successfully bred 2 Micronesian kingfisher chicks this Spring. The mated pair of kingfishers laid 2 eggs, and the keepers stole one of the eggs since 1 sibling usually kills the other. So while 1 chick is being raised by the parents, the other chick is being fed by keepers using tweezers and a hand puppet. Only 132 Micronesian kingfishers remain in the world (these new chicks increase the number to 134). In their native habitat, the birds were almost completely wiped out by invasive brown tree snakes introduced to the island after World War II. When zoos first started raising the birds in captivity, they were mystified by the fact that the birds often died at 2-4 years of age. They eventually learned that the kingfishers need to have lizards in their diet in addition to insects and chopped mouse meat. The birds can also be difficult to breed because not all male/female pairs make a love connection. Some would prefer to squabble, while others would prefer to remain platonic friends. But Lincoln Park Zoo and other zoos have had good success with their breeding programs. Unfortunately, the birds can’t be released back to their native habitat just yet since the invasive snakes have proven tough to eradicate. Conservationists hope another island might be identified that could serve as a new home for these endangered birds. Read the full article about these new chicks and the folks who raise them at The Wenatchee World. Five Mexican gray wolf pups, which include four males and a female, were born May 2nd at the Endangered Wolf Center outside St. Louis, Missouri. The pups will be released into the wild when they reach the age of 18 months to 3 years. Only 42 wolves currently live in the wild. 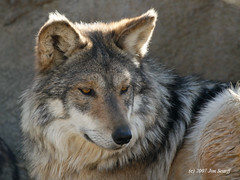 The center has been central to the recovery of the Mexican gray wolf population, with 162 pups having been born there. Executive Director Max Sebald says these 5 pups can make a big difference to the recovery of this species. He is quoted in the Associated Press article as saying, “When you start with essentially zero in the wild, these five lives make an immeasurable difference.” Read the full article and see a pic of one of the cute pups at the News-Leader. The Huffington Post has a delightful slideshow of the new Tasmanian devil exhibit at Sydney, Australia’s Taronga Zoo. The new breeding center was opened as a kind of insurance policy against the facial tumor disease that is devastating the wild devil population. Scientists from Conservation International, National Geographic, and the Smithsonian Institution have reported the discovery of several new species in the Foja Mountains of New Guinea, including a “Pinocchio” frog, an imperial pigeon, a gecko, a blossom bat, a tree mouse, and a dwarf wallaby that is now thought to be the smallest in the world. Scientists also took the first ever photos of a free-moving golden-mantled tree-kangaroo, which is critically endangered. During their quest, the scientists braved treacherous conditions, including torrential rains in dangerous terrain, flash floods, and raging rivers. A full article with photos can be found at mongabay.com. Complete results of the expedition appear in the June 2010 issue of National Geographic magazine, and more, beautiful pictures can be found here. The Michigan Department of Natural Resources and Environment has released a photo of a cougar snapped by a trail camera in the remote Upper Peninsula area of Wallace. The department says that “although the image is blurred, the photo is consistent with a cougar.” Cougars have supposedly been extinct in Michigan for 100 years, but in the last 2 years, 5 sets of tracks and 2 confirmed photos have provided evidence that the big cats do indeed call the state home. Find the full article, with the photo, at the Lansing State Journal. “It’s one of the greatest wildlife success stories in California,” Joe Hobbs, Department of Fish and Game biologist and state elk coordinator, is quoted as saying in The Red Bluff Daily News. “We’re pretty much running out of places to put extra elk.” The 22 herds of around 3,900 elk are a huge improvement from the population present in the late 1880s. Some sources say the elk subspecies, which is limited to California, numbered only 1 male and 1 female at that time. The population is now so robust that the California Fish and Game Commission is expanding hunting, offering 350 permits this year (up from 330 last year). 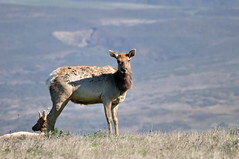 Much of the success of the herds is due to the cooperation of property owners who have allowed officials to reintroduce elk on their private land. This has been crucial to the recovery of the elk because few public areas with suitable open grassland are available. Wildlife officials still wrestle with problems such as disease outbreaks and balancing the elk’s effect on plant populations, issues that will be considered carefully as reintroduction continues. Recovery Plan for the Ivory-Billed Woodpecker? Nessie Relative in England's Lake District? Nessie Visible on Google Earth? Pesky Otter in Lake Champlain? We Believe in Bigfoot, and We Can Read Too! © 2010 Every Creature. All Rights Reserved.